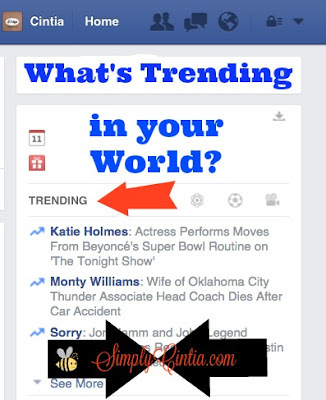 What's Trending in your World? I have a confession: I was not an early adopter of Facebook. I remember people talking about it during my Ole Miss years but I was too busy getting a Masters Degree. Then I got too busy at my first job. When I was expecting my first son, I gave Twitter a chance then eventually I joined Facebook. My least favorite thing about Facebook is the “Trending” section. It’s irrelevant, it’s annoying and I can’t stop reading it. The other day, after clicking away at “Trending” (and hoping no one found out I do that), I realized why it works. Someone, in the FB headquarters, decided that piece of information is important so the whole world should read it. What’s Trending in your Family? • what’s the latest, coolest thing you guys are enjoying? What can we learn from your family's trend? What’s Trending in your Friendships? • what has been your latest friendship lesson? You’re never stuck you know? You’re either making progress or regressing in relationships. What have you learned in that area? What’s Trending in your Character? • Life has a way of offering you promotions disguised in challenges. Those challenges help develop your character. What’s your latest character development victory? How did you get there? What’s Trending in your Faith Walk? • This is by far my favorite. I often ask people: “what is God teaching you lately?” I get an array of answers. I like the honest ones better because they encourage me in my own faith walk. I promise I will forever avoid getting caught in the FB "Trending" click fest. I also promise to answer these four questions more often and encourage others with my answers.